In 2015, there were two separate albums that struck a unique nerve in country music, even though the two albums couldn’t have been on more opposite sides of the spectrum. One was Chris Stapleton’s Traveller, which after winning Album of the Year at the 2015 CMA Awards, became the year’s surprise blockbuster. The other was Love Story released by a Southern hip-hop artist Yelawolf, which among other things, looked to make a mockery of the arena rap influences encroaching into mainstream country. Stapleton’s Traveller, and Yelawolf’s Love Story didn’t have very much in common, at least not on the surface, except both were nominated for Saving Country Music’s Album of the Year. And they both featuring the work of the quite prolific, but often overlooked and unheralded steel guitar player, multi-instrumentalist, studio owner, and producer Robby Turner. “I am attempting to make what I believe to be the purest, most uncompromising hard country album anyone has heard in 30 years,” is what Sturgill Simpson said before heading into the studio to record his debut album High Top Mountain from 2013. And to accomplish this he assembled some of the strongest true country studio talent he could find. One such player Simpson called upon was country Music Hall of Fame piano player Hargus “Pig” Robbins. Another was Robby Turner. The producer for Sturgill’s High Top Mountain was Dave Cobb, who at the time was much more of an unknown outside the industry than he is today. But slowly, fans began to connect the dots between some of the greatest records being released over the last few years, and Dave Cobb’s involvement. It’s not that Dave Cobb came out of nowhere. He was producing records since the early 2000’s. It’s just so often that when it comes to the behind-the-scenes players involved in great records, it takes longer for the public to wake up to their contributions. That doesn’t begin to tell the half of it. 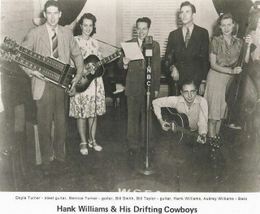 Robby Turner’s parents, Doyle and Bernice Turner, played in Hank Williams Drifting Cowboys band from 1946 to 1948. His father was a steel guitar player and his mother played rhythm guitar. Robby was born into country music if anyone ever was, and by 9-years-old he was playing drums and touring with The Wilburn Brothers. Drums would be Robby’s first instrument, but they certainly wouldn’t be his last. Turner is proficient with pretty music anything with strings, including a piano, but his passion was to follow in his father’s footsteps and play the steel guitar. At the age of eleven, Robby was working in a local honky tonk in Paragould, Arkansas three nights a week to save up enough money to buy his own steel guitar. At the age of 12, Shot Jackson of the Sho-Bud steel guitar company sponsored the young player by giving him his own rig—the youngest such player to be endorsed by the company. For the next fifteen years Robby played and toured with acts such as The Singing Rambos and Charlie Rich, and began to be known for his studio work, both as a player and a producer. But it was in 1990 when everything would change significantly, and Turner’s legacy would be cemented. Well-known producer Chips Moman was looking to field a group of musicians to be the backing band for the supergroup The Highwaymen, and asked Turner if he wanted the steel guitar position. Robby became a staple of The Highwaymen sound, and perhaps even more importantly, the gig led to a close friendship with Waylon Jennings that lasted all the way up to Waylon’s death in 2002. From the start of The Highwaymen until the very end of Waylon’s life, Robby was Waylon’s go-to steel player, and one of his seminal right hand men. If you want to know where some of the comparisons between Sturgill Simpson and Waylon Jennings come from, it’s partly due to the presence of Robby Turner on both of their recordings. It’s the responsibility of the side player to remain subordinate to the stars, and to do what they can to make the frontman the center of attention. You don’t want the steel guitar player to steal the show. But it was in 2012 when Robby Turner first assumed a more out-front role as he completed the solemn and important task of finishing a collection of songs Waylon recorded before his death. Waylon went into Robby’s “Turner-Up” studio to cut his final recordings—just simple vocal and guitar tracks, and left them in the care of Robby with the instructions to finish them some day. And finish them he did, resulting in 2012’s Goin’ Down Rockin’ – The Last Recordings—one of the year’s surprisingly best efforts. Robby Turner’s contributions range incredibly far of field. He toured the world with the Dixie Chicks. He’s worked in one capacity or another on albums from Willie Nelson, Travis Tritt, Jim Lauderdale, Deryl Dodd, Randy Travis, Paul Simon, Rodney Crowell, Charlie Robison, Mark Chesnutt, Gary Allan, Marty Stuart, Jamey Johnson, Nikki Lane, Billy Done Burns, and so many more. Robby Turner has even released a solo album, appropriately titled Man of Steel. When Dave Cobb and Chris Stapleton were looking to assemble a band to record Traveller, they wanted a stripped-down skeleton crew who could play all the songs live and take direction on the fly. 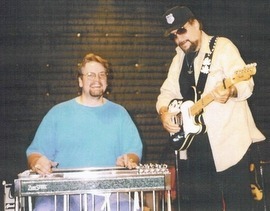 The first and last person they wanted for steel guitar was Robby Turner. 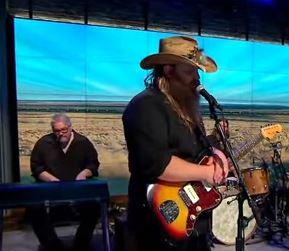 Amid Chis Stapleton’s success, Robby has been seen behind Stapleton playing on The View and CBS This Morning, though not in his regular spot behind the steel guitar, but playing organ on “Tennessee Whiskey”—once again speaking to Turner’s versatility. My favorite steel guy is still Lloyd green. It’s really hard to be his work with Johnny Paycheck during his little darlin’ years. Mine is Tom Brumley. Although Jerry Brightman was pretty exciting too. I think the Buckaroos consisted of some of the most tasteful and unique sidemen in Country Music. I’m not crazy over it but it has some very unique songs. Nice, i’m going to have to punch up these names when I get home. Great article, it is great to see such a talented legend still making history. 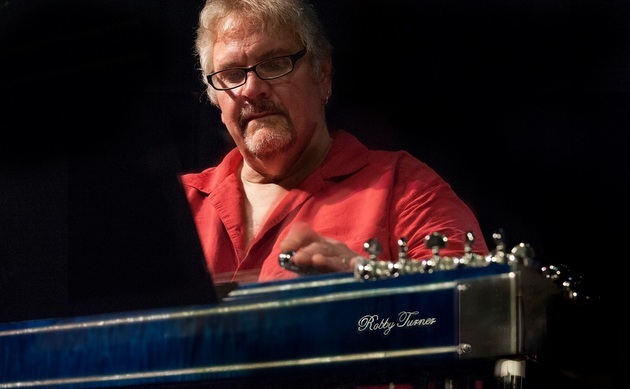 Often overlooked by many, Robby is way up there with the list of Pedal Steel greats. AMEN!! Cutting edge steel playing on the LD releases! them both on stage with him, they were both amazing steel guitarists. I’ll openly blame my childhood for this but I consider Bruce Bouton my favorite steel guitar player but I’ve also been enjoying Lloyd Maines’ work on Hold My Beer vol. 1. I’ve been enjoying Turner’s work on Traveler and hope to hear more in the future. Also if you haven’t heard of Steelism check them out, it’s all instrumentals and there are some badass songs they’ve written – I’m also always glad to see young players carrying the pedal steel torch. It’s not country, kind of hard to describe, but like the link above, I think anyone will like it that appreciates the instrument. great story Trigger . love to see the guys in the trenches acknowledged as integral parts of any artist’s success …. What a well written story & I am honored. In reading the comments, I will say that there is no bigger fan of Ralph Mooney, Lloyd Green, Tom Brumley & Red Rhodes than myself. Where I didn’t personally know Red, the other three are dear friends of mine (R.I.P. Mr. Moon & Terrific Tom), as were Jimmy Day, Buddy Emmons, Shot Jackson, etc…. Thank you Trigger for taking the time to feature a sideman in this ever changing business of music, but to me, it’s always considered an art form. Love your work on the Gin Blossoms song “Cheatin”! Gosh this is a great article. Paul Franklin is my favorite and now I’ll check out Robby’s work. Recently had the pleasure of mixing a live album of The Parks, featuring Johnny and Clint Park that Robby played steel on. I have worked with a fair number of great steel players during my 28 years in Nashville, including Bruce Bouton, Mike “Cookie” Jones, Doug Jernigan, Rusty Danmyer, Mike Douchette and many others, including a once a week gig with Jimmy Day that lasted about a year. Robby Turner is unique, deep and wide. The parts he plays are rarely like anyone else’s but still very country. His playing on the entire 17 song CD was dead on the money. Not a single fix or edit and his parts really raised the project up a level. It’s been a pleasure to get to know him and work with him. His solo albums are killer too. I think it’s damn cool to know that the guy who plays steel in Stapleton’s band today, and who also played on Sturgill’s first record, was formerly Waylon Jennings’ right-hand musical man. There’s a real sense of Mr. Turner being a link in a musical chain. I love that. It’s always great to see musicians getting a little attention. I love what I know of Turner’s work and you mention a number of artists he’s worked with that I never realized. It’s like when I discovered that Jerry Douglas wasn’t just that great dobro player from Allison Krauss’ band… I feel dumb for not knowing sooner, but love digging into all I missed. I really love the sound of pedal steel. I think Maggie Bjorklund is my favourite player simply because she stretches the instrument well beyond its traditional country roots. Pretty sure I saw Robby playing with Chris Stapleton at Willie Nelson’s Picnic this past year.